Sometimes you need to move your sFlowTrend installation to a new server. This is quite easy to do without losing any data, but you have to be careful to make sure it goes smoothly. All of the data is in the sFlowTrend home directory. For free sFlowTrend, this contains the configuration and user preferences (when using the web client). For sFlowTrend-Pro, it also includes all of your traffic data contained in the database. Next, stop the sFlowTrend service on the old system. It is essential that you do this step, otherwise data is likely to be corrupted. On Windows, use Windows Administrative Tools>Services, find sFlowTrend-Pro server, and stop it. Once you have stopped the service on the old system, move to the new one. Go ahead and install sFlowTrend on this system, again taking note of the home directory. Then, stop the sFlowTrend service on the new system - again, it is critical that you do this step. After this, copy the entire home directory from the old system to the new system, ensuring that the ownership and file permissions stay the same. Start the service on the new system. At this stage, sFlowTrend should be running on the new system. There may be a couple of other tasks that need to be done. First, if you are using sFlowTrend-Pro and the new system has a different hostname from the old, then you will need to update the license to have the new hostname. To do this, go to www.myinmon.com, log in, and click the Request New Key link to the license. The license will be updated shortly. Next, if the IP address of the new system is different, then you will need to update the sFlow configuration on your infrastructure to forward sFlow data to the new system, rather than the old. There's more information on configuring sFlow in this blog post, and in the on-line help. Now you have sFlowTrend running on the new system, you can uninstall it on the old. To recover some space, you can also delete the home directory on the old system, as this isn't automatically deleted when uninstalling. A common question that network managers handle is "Why is the network slow?". In many cases, poor network performance can be caused by a localised overload. This may be caused by mistakes in the network configuration, equipment malfunctions, inadvertent mis-use, or because capacity is insufficient for the normal load. 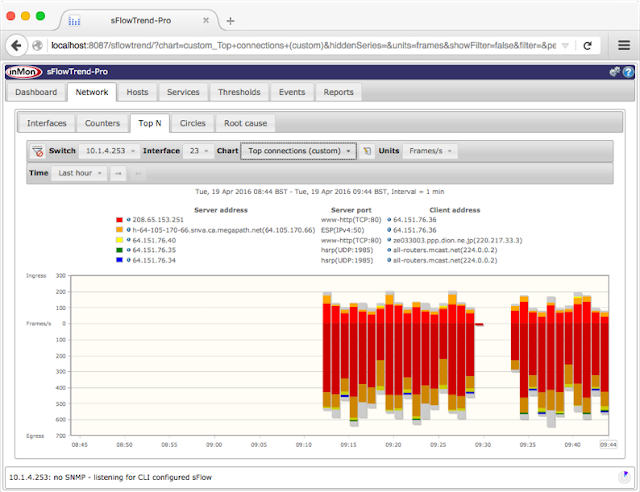 Since an sFlow enabled network and sFlowTrend provide complete visibility of network usage, it is easy to pinpoint overload conditions and take appropriate action. It is even possible to receive alerts so that proactive controls can be implemented to prevent poor performance occurring. 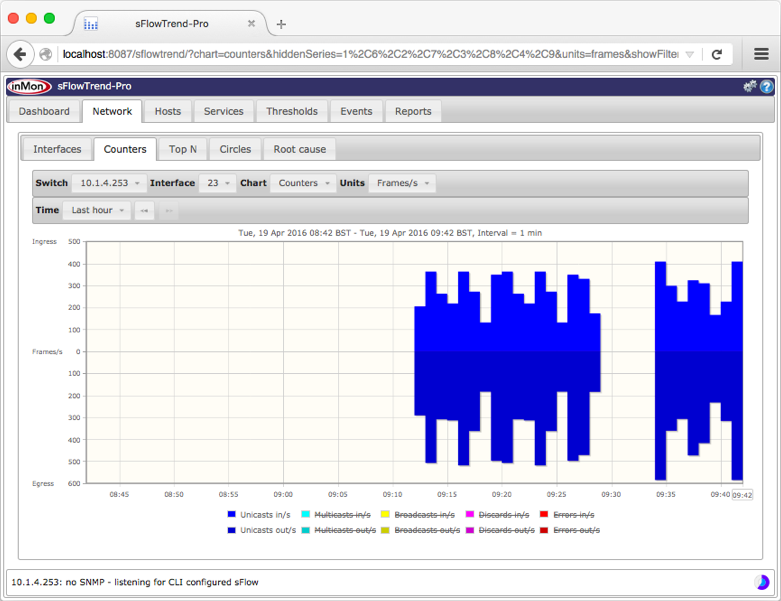 Here is an example of how sFlowTrend helps you identify and diagnose network overload conditions. Dashboard, Thresholds indicates an abnormally high level of unicast traffic. Click on the unicast indicator to view the Thresholds tab and find out why. The Thresholds tab indicates the switch 10.1.4.253 is experiencing the abnormally high level of unicast traffic. Click on the unicast indicator to see which interfaces are affected. 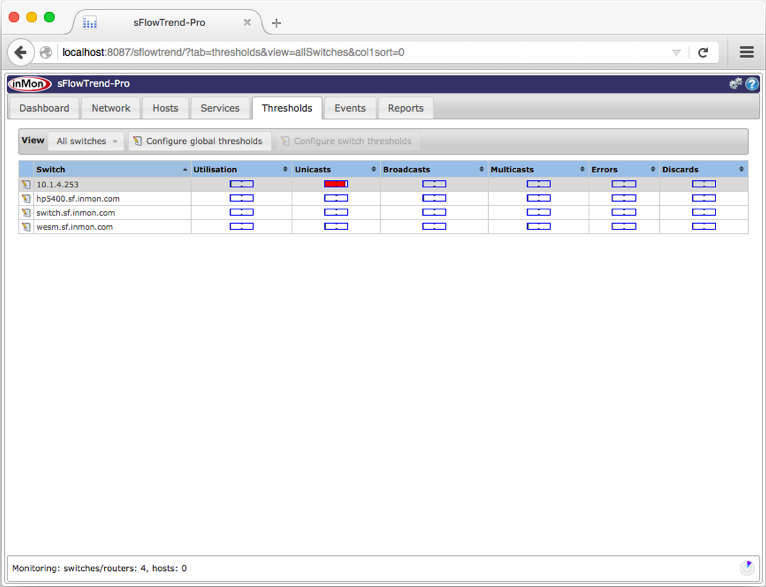 The interface with ifIndex 23 is most affected by the unicast traffic. Click on the unicast indicator to bring up the menu and select Root cause to see who and what is contributing to the unicast traffic. 100% of unicast frames are sent from hosts in the External subnet to hosts in the External subnet. Looking at the fourth row, 58% of the unicast frames are sent from 208.65.153.251 TCP:80 to 64.151.76.36. From this we can conclude that the major factor causing the abnormally high unicast traffic is web traffic from server 208.65.153.251 (which is in the External subnet). To see for how long abnormal levels of unicast traffic have affected this interface, click on the Network > Counters tab (or choose View chart from the Root cause tab menu). The Network > Top N tab displays the details of the top connections. In this example we have created a custom top connections chart that allows us to focus on the server port and ignore the ephemeral client port. The Network > Circles tab allows you to visualise the traffic flows between groups of addresses to help understand the communication patterns across the network. Receiver address and port: The IP address and UDP port of the system that sFlowTrend is running on and on which it will receive data. 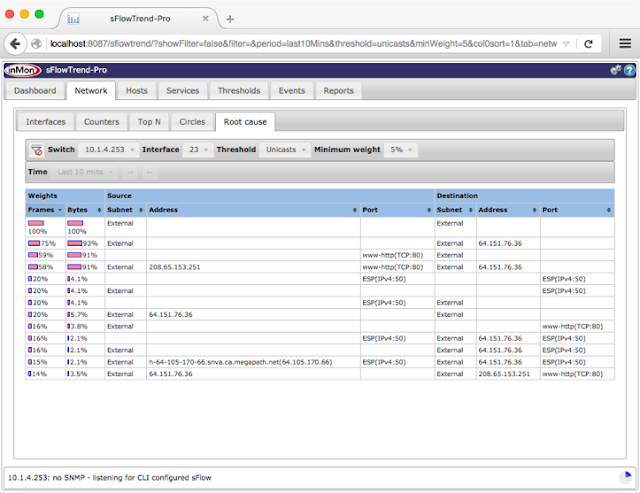 By default sFlowTrend-Pro listens on all the system IP addresses using UDP port 6343. The configured receiver address must be reachable from the switch running the sFlow agent. Sampling rate: The ratio of packets carried by an interface to the number of packets sampled. For example a sampling rate of 1024 specifies that, on average, 1 packet sample will be generated for every 1024 packets carried by an interface. The sampling rate configured should generate enough samples to be statistically significant, but not too many samples such that the scalability of the system would be affected. Some suggested sampling rates for different traffic levels are given in the sFlowTrend help. Polling interval: Controls how frequently counter data (for example interface counters) are exported. Configuring a counter polling interval of 30 seconds is recommended. This will cause counter data to be exported every 30 seconds on average. Since sFlowTrend accumulates data with one minute granularity, setting a counter polling interval of less than 20 seconds generates more load for the switch and the network without improving the resulting measurements. In addition, some sFlow agent implementations allow the sFlow agent address to be configured. The sFlow agent address is included in the exported sFlow data and must uniquely identify the switch. sFlowTrend uses this address to attribute data to the different switches. Some sFlow agent implementations have an inappropriate default sFlow agent address of 0.0.0.0 or 127.0.0.1. This must be changed to a unique address for the switch, preferably an address that will respond to SNMP requests, in order for sFlowTrend to work properly. If the IP addresses for a switch are changed, then you should check that the sFlow agent address is updated properly; this sometimes requires a restart of the sFlow agent. There are two methods for configuring the sFlow agent: SNMP and Command Line Interface (CLI). If a switch implements the sFlow MIB, sFlowTrend can use SNMP to configure the sFlow agent. In this case, you must ensure sFlowTrend is configured with the IP address of the switch and the correct SNMP credentials. The switch must also be configured to allow SNMP read and write from the sFlowTrend system. sFlowTrend will then make sure that the switch is configured with the correct settings for receiver address and port, sampling rate and polling interval for all interfaces. Follow the steps in the section in the help Adding a switch configured by SNMP. The help also outlines steps for verifying and troubleshooting the configuration. sFlowTrend uses SNMP to walk the ifTable to discover all interfaces and their ifSpeeds. This process also ensures that basic SNMP read access is working. sFlowTrend then tests for the existence of the sFlow MIB. On discovering the sFlow MIB, sFlowTrend then tries to claim a receiver entry by using SNMP SETs to write its configured receiver IP address and sFlow port, a unique string identifying this sFlowTrend instance, and a timeout value into the receiver entry. 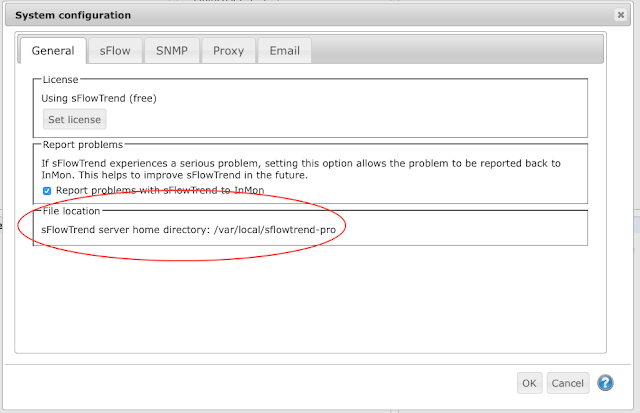 The receiver address and port used by sFlowTrend are configured in the System configuration, sFlow configuration dialog. A switch will support a fixed number of receiver entries, limiting the number of sFlow collectors that it can send data to. If all of the receiver entries have been claimed by other sFlow collectors, then sFlowTrend will fail to configure this switch and in the Configure agents dialog will report Already in use and list the other sFlow collectors. You can tell sFlowTrend to overwrite an existing receiver entry when there are no free entries by using the sflowtrend.useForce setting. After having successfully claimed a receiver entry, sFlowTrend will then set sFlow MIB entries for each interface to configure the polling interval and the appropriate sampling rate. sFlowTrend chooses the sampling rate based on the ifSpeed of the interface discovered by walking the ifTable. 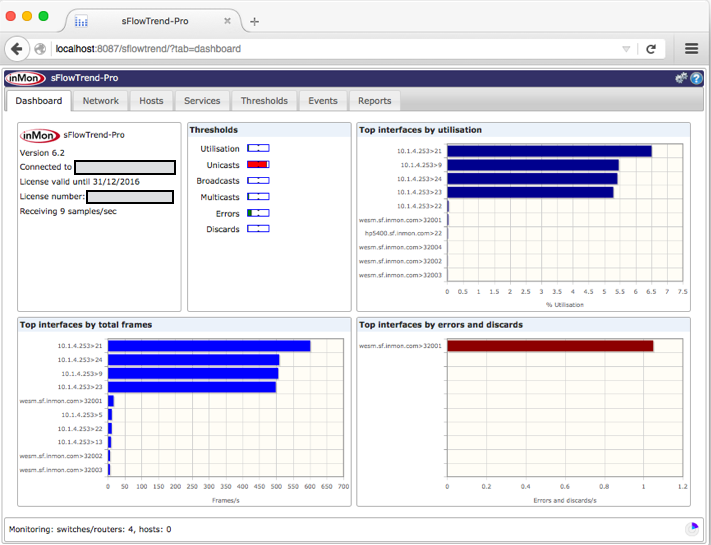 Periodically, sFlowTrend will refresh the timeout value in the receiver entry using an SNMP SET. This ensures that the switch will continue to send sFlow. However, if sFlowTrend is stopped, the timeout will decrease to zero and on reaching zero, the switch will clear the receiver entry and stop sending sFlow to sFlowTrend. This means that no resources are used in generating unwanted sFlow. The switch is configured with the correct receiver address and UDP port. 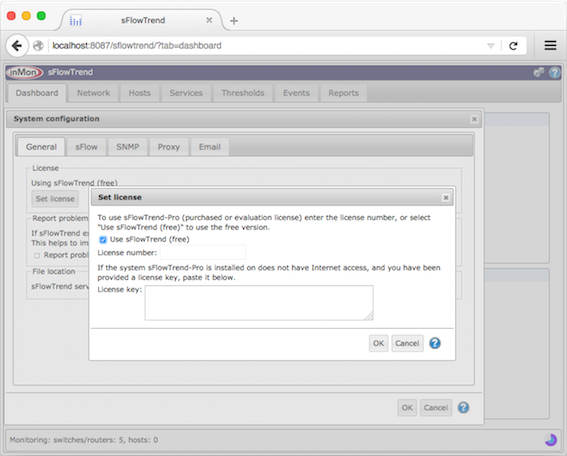 You can verify the UDP port that sFlowTrend is listening on in the System configuration, sFlow configuration dialog. 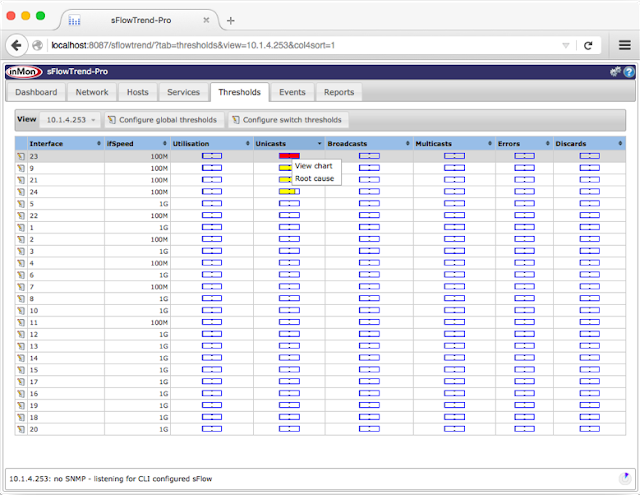 There are no firewalls on the sFlowTrend system or the network that are blocking sFlow data. The sFlowTrend system is reachable from the switch. The sFlow agent on the switch is configured with a unique sFlow agent address. If you want sFlowTrend to display interfaces using ifName or ifAlias, or to display the sysName of the switch, you must configure sFlowTrend with SNMP read access to the switch. For a Windows installation, use the Windows installation package unless you are running a 64-bit version of Windows with a 64-bit JRE installed, in which case use Windows 64-bit installation package. For a Linux installation, select either the Linux installer download, which is a graphical and CLI installer, or install using an RPM or .deb file. If you choose the RPM or .deb option, and have a previous installation using the installer, uninstall the previous version before installing the RPM/.deb file. For an Apple Mac installation, use the .dmg installation package. Make sure that you have Java 1.7 (or later) installed, then run the sFlowTrend or sFlowTrend-Pro installation package following the instructions. Once you have installed sFlowTrend or sFlowTrend-Pro, open the GUI by pointing a web browser to http://[hostname]:8087/sflowtrend or https://[hostname]:8443/sflowtrend. You must now configure the license. To use sFlowTrend-Pro, deselect "Use sFlowTrend (free)" and enter your license number from your account at http://www.myinmon.com. Note that normally sFlowTrend-Pro will use the Internet to download the license key, once the license number has been entered. If a proxy configuration is required for the server to connect to the Internet, please make sure that the proxy is correctly configured. On initial installation, until you configure the license you cannot use the rest of the product; this means that the proxy also cannot be configured. To work around this, if you have to configure a proxy, first select the option to use the free sFlowTrend license, then configure the proxy, and finally go back to the license dialog and enter your actual license number. If the system has no Internet connectivity at all, then the license key can be entered manually. You can request a manual license key using a support request from your account at http://www.myinmon.com. 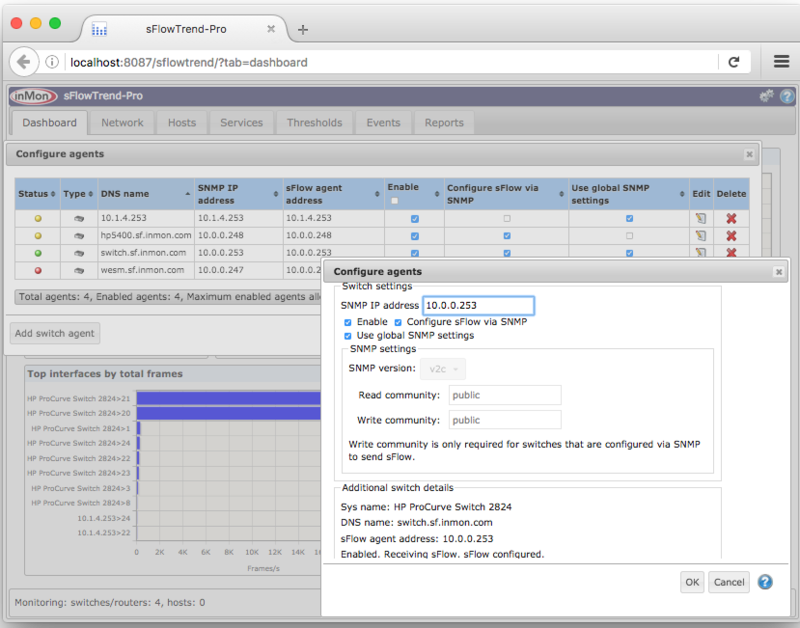 Now configure your switches to send sFlow to sFlowTrend-Pro. Another blog post will describe this in more detail. The Dashboard will show the incoming sampling rate and the status bar will indicate the number of switches and hosts being monitored. The troubleshooting section of the help includes some things to check if sFlow is not being received. sFlowTrend is the free version of sFlowTrend-Pro. 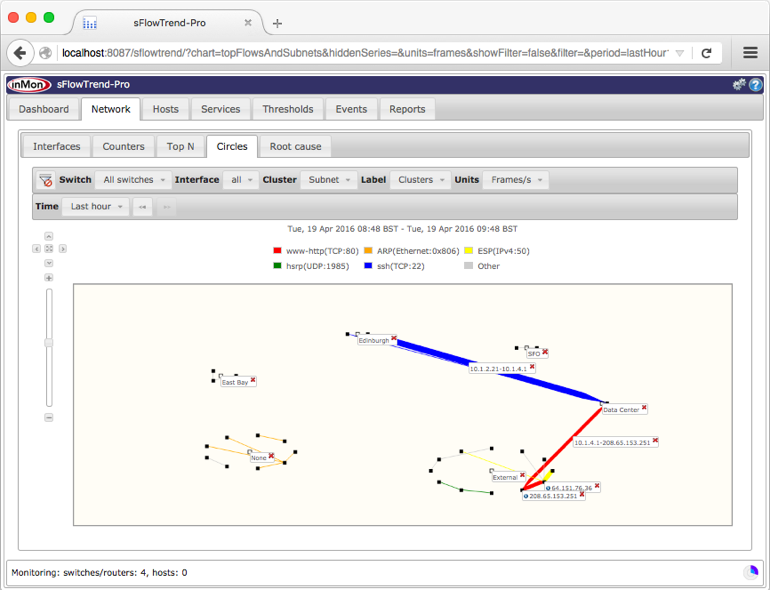 sFlowTrend is limited to analysing data from a maximum of five sFlow agents and stores one hour of data in memory. sFlowTrend-Pro does not limit the number of switches, routers, or hosts that can be monitored and stores data persistently to disk for a configurable period (default one week). sFlowTrend-Pro also supports navigation through and reporting over the whole history of data. If you have already installed sFlowTrend and have purchased an sFlowTrend-Pro license, you can upgrade your installation by configuring your installation with your sFlowTrend-Pro license using the configuration menu. Welcome to the sFlowTrend blog. The purpose of this blog is to provide tips for using sFlowTrend and sFlowTrend-Pro so that you get the most out of your sFlow® enabled switches, virtual switches, routers, and hosts. The help is the definitive documentation for sFlowTrend and sFlowTrend-Pro. These blog posts are intended to address frequently ask questions and more detailed usage examples and case studies. 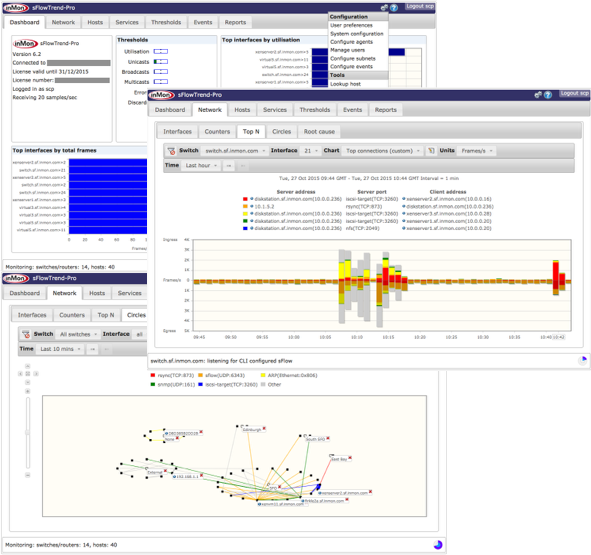 sFlowTrend and sFlowTrend-Pro are scalable, network and system performance analytics tools, built from the ground up to exploit the detailed data available from the popular sFlow® standard. Both sFlowTrend and sFlowTrend-Pro identify who is using the network, for what purpose and how intensively. The web UI provides real-time, interactive charts and historical reports. In addition, sFlowTrend-Pro exposes a REST API for fully flexible data access and integration with other tools. This type of analytics is ideally suited to common management tasks such as diagnosing performance problems, identifying mis-use and abnormal traffic (eg security threats), understanding trends and accurately targeting upgrades, generating management reports.